A picture-book look at one of fashion’s most iconic designers. First published in the Netherlands in 2013, this playful sketch of Coco Chanel treats pre-readers to a revealing glimpse of the designer’s early life. 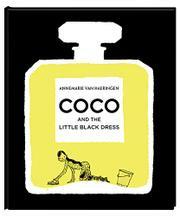 Born to humble origins, Coco grows up in an orphanage, sent there by her father when her mother died prematurely. There, under the strict tutelage of nuns, Coco learns needlework even before reaching her teens. Young Coco soon finds that her talents as a seamstress and singer gain her entree into high society, where, van Haeringen suggests, observing the rich inspires her. “So this is what rich people do!” Coco notes: “They go to parties, to the races, and to the beach. But look at their clothes…those hats!” Coco’s response is to create jodhpurs for women, and she makes her first splash into fashion by designing hats. As her passion for creating fine clothing turns into a vocation, Chanel loosens the stays of the Edwardian corset and aims for more practical designs, like crushable hats and the eponymous—now ubiquitous—little black dress. Van Haeringen’s spare mixed-media illustrations throughout this tiny tribute are as alluring as her subject’s timeless designs, capturing the eye with fine pen and ink detail, stark colors, warm watercolor shading, and Bemelmans-like playfulness.